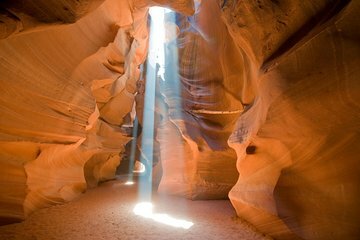 Antelope Canyon — a narrow slot canyon carved to stunning perfection throughout the millennia — is a sight to behold. Photo opportunities abound as soft hues illuminate the twisting sandstone cliffs. See this renowned beauty of the American Southwest on a day trip from Flagstaff, with stops at the Cameron Trading Post and Horseshoe Bend. Boxed lunch included. Following hotel pickup in Flagstaff, the excursion to Antelope Canyon takes you past ancient volcanoes and the aptly named rock formations of the Painted Desert. On arrival, walk with your guide along twists and turns and marvel at Mother Nature’s artistry as the sunlight descends into Antelope Canyon. Belonging to the Navajo Nation, the gorgeous slot canyon features sandstone cliffs that display dramatic shafts of light and shifting colors — from sherbet orange to violet — throughout the day. Additional highlights on your narrated tour include a stop at the Cameron Trading Post. Browse for pottery, jewelry, and award-winning crafts on display by Navajo, Zuni, and Hopi artisans. A boxed lunch is served at Glen Dam overlooking Lake Powell. Get a glimpse of Glen Dam Gorge on the other side. Then hike up to Horseshoe Bend for a look at the Colorado River from above, before making the trip back to your hotel.